My small ‘Bali’ cherry tree is especially productive this year. So far, I’ve picked about a gallon and a half of nice cherries off the tree and there are plenty more where those came from. I’ll be picking daily over the next week or so, or until the birds clean out the rest. A very small portion of this year’s harvest, ready for baking. This is by far the best crop I’ve had from my cherry tree, which has been in the ground about eight years now: abundant cherries, no pests, and the birds haven’t cleaned out the tree even though I did not put a net on the tree this year as I have in the past. I attribute some of that good harvest to the pruning we did last fall, which opened up the center of the tree and improved air-flow through it. ‘Bali’, sometimes called ‘Evans’ cherry, is a sour cherry, discovered by the Canadian horticulturist Ieuen Evans in the 1920s. The trees stay relatively small — mine is under 10 feet tall. It’s a pretty tree for a smaller landscape and is covered with delicate white blossoms in the spring. 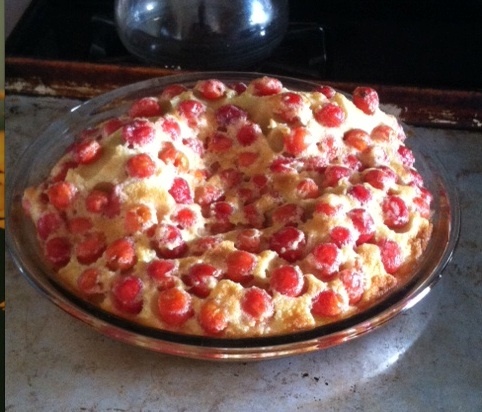 The cherries are pretty, too, and make a great pie, cobbler or — what I did Saturday — clafoutis. A French confection, clafoutis lies somewhere between custard and a pancake. It’s easy to put together and, in my mind, works as a breakfast as well as a dessert. Clean and pit enough cherries to fill the bottom of the pie plate–2 to 3 cups. Because my cherries are sour, I covered them with about 1/3rd cup of sugar and rolled them around so the cherries were coated with sugar. Whisk the eggs together with the sugar, vanilla, cinnamon and salt until well combined. Add the flour and whisk to incorporate it. Then, add the milk and whisk. The batter should be similar to a thick pancake batter. 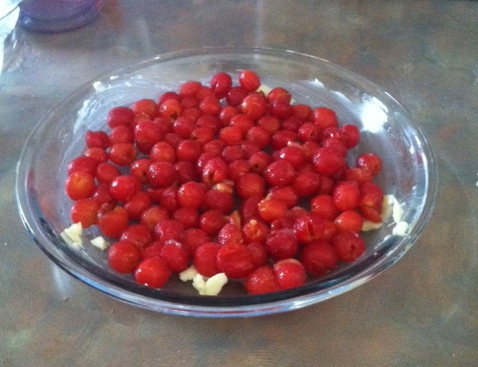 Gently ladle or pour the batter over the cherries in the pan. You want even distribution of cherries in the clafoutis. Bake the clafouti for 45. It will be puffed (though hopefully not so lopsided as mine was!). Lightly sprinkle with powdered sugar, if desired. This tastes wonderful fresh from the oven as is, or you could put a dollop of whipped cream on it for even more decadence. I also ate a piece for breakfast the next morning and that was wonderful, too.